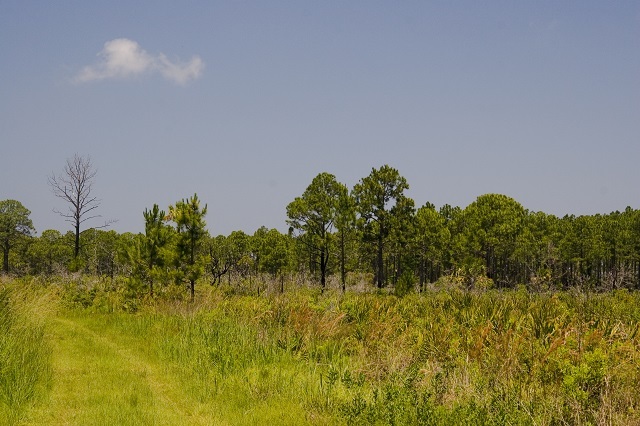 The spectacular Cedar Key Scrub State Reserve is divided by CR 347 into east and west tracts. The east side has 4 miles of color-coded, multi-use trails and firebreaks available for exploration, and features flatwoods, sandhills and scrub. The latter provides habitat for the Florida Scrub-Jay, of which there are only a few left at this site. Common Ground-Dove, Pileated Woodpecker, Eastern Indigo Snake, Gopher Tortoise and Florida Mouse also occur here, thanks to ongoing restoration and management activities. The west portion has 8 miles of multi-use trails and slopes down through Black Point Swamp to tidal creeks and salt marsh; listen for Clapper Rail, Marsh Wren and Seaside Sparrow. Additional habitats on the west side include flatwoods, basin marsh and hydric hammock. Watch overhead for Short-tailed Hawk (rare), Osprey and Bald Eagle. Butterflies such as Yucca Giant-Skipper, Appalachian Brown (rare), Henry’s Elfin and Zebra Swallowtail reside here. This is a beautiful, rustic reserve, one not to be missed. Come with water and prepare to hike or bike. Portions of trails may be flooded at times. Limited hunting takes place here in fall; please click here for more information. Although no launch is provided within the reserve, paddlers may explore the tidal creeks and salt marsh; canoes and kayaks are available for rent in Cedar Key.